The ability to assess the relative resilience of coral reefs has advanced dramatically in recent years. To support reef managers in assessing and monitoring reef resilience, we present a 10-step process to help managers to assess, map and monitor coral reef resilience, and guide the prioritization of actions that support resilience in the face of climate change. These steps represent the culmination of over a decade of experience and builds on ideas first presented by West and Salm (2003), Obura and Grimsditch (2009), and McClanahan et al. (2012). Resilience assessments can be resource and labor intensive. Therefore, it is important to consider whether the need from the information outweighs the cost of undertaking an assessment. Any assessment will need to be tailored to the available resources and should include a budget for both data collection and analysis. Resilience assessments are most useful when the results can be used to directly inform management actions. To ensure resilience assessments influence management decisions, they should be timed to coordinate with management decision-making processes (e.g., the zoning or rezoning of an MPA or MPA network) and should include managers in the data collection and/or analysis. Finally, some coral reef areas may be very homogeneous with respect to coral communities and impacts to those communities. In these areas, resilience potential may not vary significantly so resilience assessments may not inform management actions. 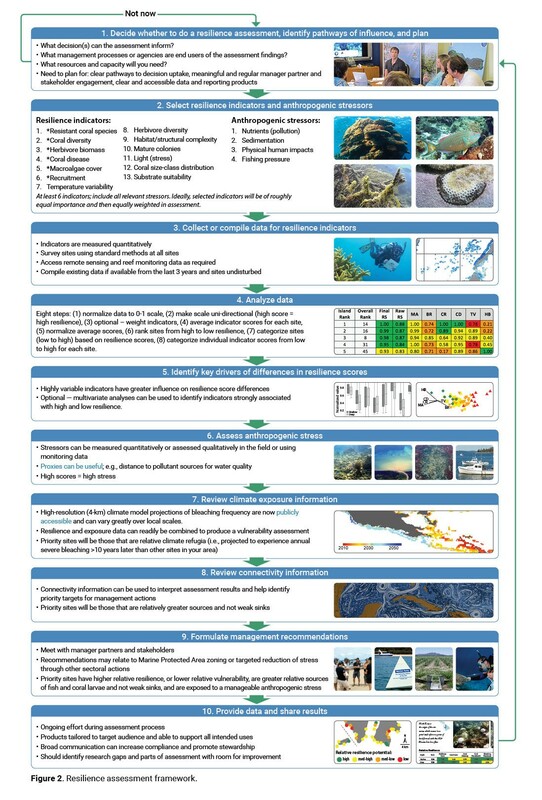 To assess homogeneity, managers may assess whether their selected resilience indicators vary for reefs in their area by either reviewing monitoring data or speaking with local experts or other specialists. Managers may decide that a resilience assessment is not useful for informing management actions if, for example, over half of the selected resilience indicators do not vary significantly in their area. These pages were developed in collaboration with Dr. Jeffery Maynard. Contact him at maynardmarine@gmail.com for more information.